There is an unusually good look at those bright spots and how they are laid out across the geography—plus, all the different types of craters that house them. The most interesting thing may be the false color filter that NASA slapped over the whole thing. Because, essentially, the color filter also acts as an age-map. The bluer patches are younger areas of the surface while those grey-brown areas are older, and as you can see in the video, those colors are pretty swirled together across the surface. 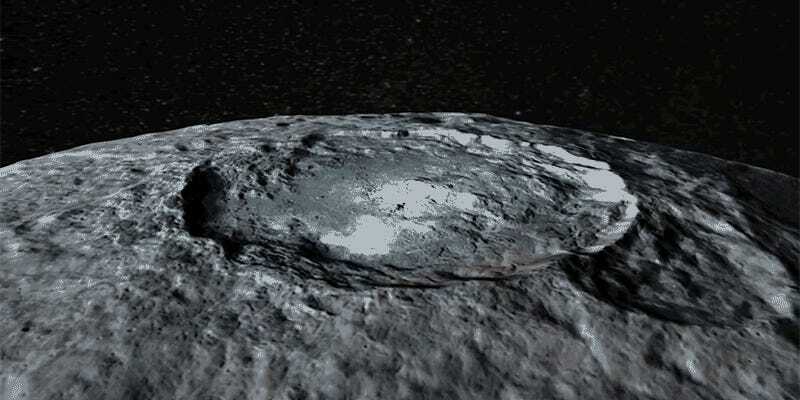 In other words, this isn’t a dead dwarf planet, it’s one that was very recently—or is perhaps even still—active.